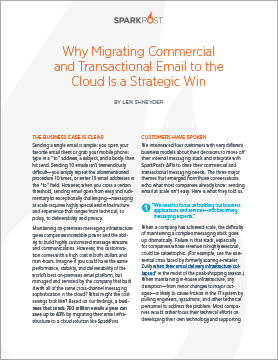 Moving email delivery infrastructure to the cloud is a strategic win for companies that send high volumes of commercial and transactional email. In fact, a business that sends 750 million emails a year can save up to 40% by migrating email infrastructure to the cloud. Customers have spoken: a cloud-based approach to email delivers ongoing operational advantage as well as significant bottom-line cost benefits. Download this business brief to learn why.